A Resource is any book, text, DVD, CD, etc. that is used by a student to complete an assignment. 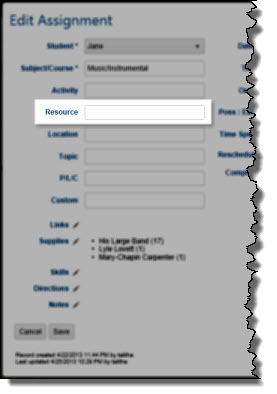 In HSTOnline, the Resource field is optional. By selecting a specific Subject or Subject/Course combination, you can generate a Courses or Resources report which lists titles by Subject or Subject/Course for your records. You can create your Resource while entering a new Library item. 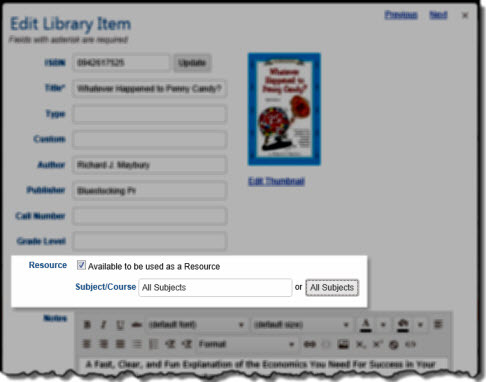 The directions below show how to create a Resource from existing Library entries. The Resource field in Assignment and Lesson Plan add, edit and multi-edit windows is a Smart-Entry field. To review your Resources, click or touch Library under the 'Manage Lists' section of the HSTOnline menu. In the Agenda - Calendar View the Assignment tool tip, will display the thumbnail of the Resource if one exists. In the Add or Edit Assignment window you can click or touch the icon next to the Resource field to bring up the Resource thumbnail if one exists. The Resource field is optional and can be enabled and disabled via Program Options in the HSTOnline menu. Library add/edit windows will always show the Resource field. By default, the Resource field is enabled. Click or touch the box next to Resource to add a checkmark to enable the field; or to remove a checkmark to disable the field. On the Library page, double-click on the item you want to designate as a Resource to open the Edit Library Item window. Alternatively, you can click once on the item you want to designate as a Resource and then click the Action button and choose Edit to open the Edit Library Item window. On a touch device, touch the item you wish to designate as a Resource and then touch the Action button and touch Edit to open the Edit Library Item window. To make this item available as a Resource, check the Resource box. Tie this item to Subject, Subject/Course, or All Subjects. 'All Subjects' is the default selection. To change from the All Subjects setting, begin typing the name of a Subject or Course or press the spacebar. While in Edit mode, you can make any other changes needed to this Library item. 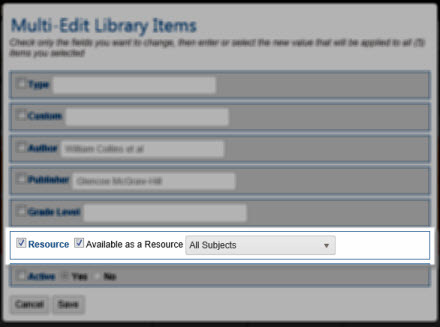 On the Library page, select the items you to which you want to add the same Resource designation. Use your mouse to click and drag over contiguous Library Items in the list to select those items. Click or touch the Action button and choose Multi-Edit to open the Multi-Edit Library Items window. Click or touch the box to the left of Resource. Click or touch the 'Available as a Resource' box and set the desired Subject/Course from the drop down list. You must select from an existing Subject or Subject/Course when in multi-edit mode. Make any other changes needed for the selected Library items. 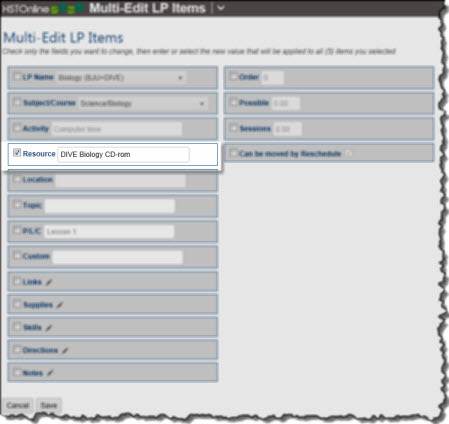 Save" to commit the changes and close the Multi-Edit Assignment Library Items window. Open an Add or Edit window for an Assignment or Lesson Plan item. Press the space bar to get a list of all matching Resources, or type a few letters to limit the list to items whose titles start with the letters you have entered. Use your mouse or down arrow key to scroll to the Resource you want to use. When the correct Resource is highlighted, press the Tab key on your keyboard, or click or touch the entry to fill the Resource field with that selection. You also have the option to simply type the name of a new Resource. When you click the Save button, the new Resource will be added to your Library list, marked as a Resource, and will be tied to the 'All Subjects' option. You can go to the Library to edit the new Resource to select a different Subject/Course designation and/or to add additional information to the item such as ISBN, Author, etc. Open the Multi-Edit window for selected Assignments or Lesson Plan items. If you want to permanently remove a Resource that has not been used, you will need to delete the Library item itself. However, you may find it best simply to Edit the Library item to remove the Resource designation. 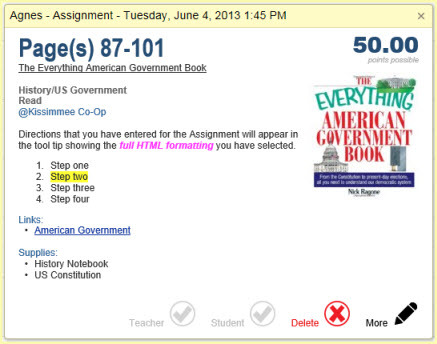 Remove the Assignments designation: Edit the Library item and remove the check in the 'Use as a Resource' box.